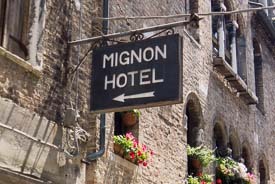 The Hotel Mignon is a three-star hotel near the Campo Santi Apostoli and the Strada Nova (Venice's busiest middle-class shopping street). It incorporates the former Locanda Novo, which is now an nine-room annex named the "Mezzo Pozzo" and is located just across the street. The hotel has 24 air-conditioned rooms in all, each with a traditional Venetian decor and free Wi-Fi Internet access. As you leave the pier, turn right and look for a narrow street on your left: the Salizada dei Spechieri. Walk inland on the Salizada Spechieri, past the Gesuiti Church to the Campo dei Gesuiti. You'll see a bridge ahead of you. Cross the bridge and continue along the Salizada Seriman to the next canal. At the canal, bear right slightly and cross the bridge. Continue walking down the Salizada L. Borgato, which will feed into the Rio Terà SS. Apostoli. Walk straight ahead on the Rio Terà SS. Apostoli. When you reach a cross street, the Calle Larga dei Proverbi, turn right and then turn almost immediately into a tiny street on your left. Look for the Calle dei Preti on your right. The Hotel Mignon & Mezzo Pozzo is in the Calle dei Preti at no. 4535.